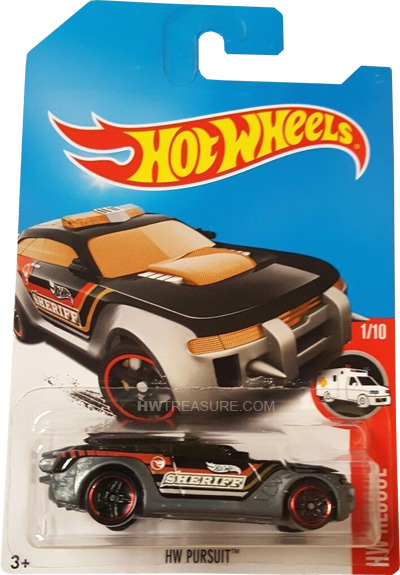 DVD04 is a 2017 Treasure Hunt and 1/10 in the HW Rescue series. The silver-gray car features black graphics with orange stripes. 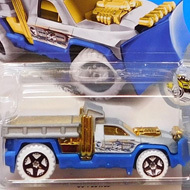 The sides are decorated with “Sheriff”, the Hot Wheels logo, and the low production symbol. The vehicle has tinted windows, a dark interior, black Open-Hole 5-Spoke wheels with orange rims, and a Malaysia base. 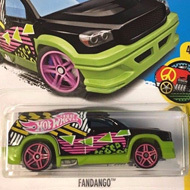 This vehicle can be found in mix “G” of 2017 Hot Wheels mainline cases. The HW Pursuit made its debut in the 2013 HW City – HW Rescue series. It is a unique design of a high-speed pursuit vehicle with a jet engine.